Looking for the perfect gift for yourself or a loved one? Here are ten tech gadgets that you should checkout while shopping over the holiday season. The Apple Watch has many features that can help you to lead a healthier lifestyle including advanced health and fitness tracking. It can detect if you have a low or high heart rate which may signal a health problem that you are not aware of. Its workout detection feature can automatically detect if you are in the middle of a workout and will ask if you want to track it. The watch also has the ability to receive texts, place calls and stream music and podcasts to your headphones. The Echo which is powered by Alexa, Amazon’s voice assistant allows users to perform a variety of tasks just by saying a few words. The most popular use of the Echo is to play music. Users also like to use their Echo listen to the weather forecast, check the news, set alarms and control other smart home devices. This modern version of the polaroid camera has Instagram like features that allows users to take instant pictures in a beautiful square format. Users can also add filters and edit images before printing. The Moleskine smart writing notebook is similar to a standard notebook in size but has many additional features. One of the features is a smart pen that has an infrared camera close to the tip of the pen to track movements as you write or draw on the smart notebook. The technology underpinning the smart notebook makes it possible to transcribe handwritten notes into digital text in conjunction with the Moleskine Notes app. Drawings can also be transferred from the notepad to a computer in real time. For people that cannot keep track of how much water they drink in a day they may want to try the Ozmo smart water bottle. The water bottle has a sensor that detects changes in water levels to provide an accurate assessment of total water consumed. The high-tech water bottle can also sync with a Fitbit and Apple Health so that the user can keep track of their health goals. This cellphone charger doubles as a phone sanitizer. Put your cell phone into PhoneSoap’s charging station and it cleans your phone while it is being charged. Using a UV light it kills 99% of bacteria. This wi-fi plug allows you to control the power source to your devices remotely using your smartphone. No more worrying about whether or not you have left your flat iron on after you have left home. 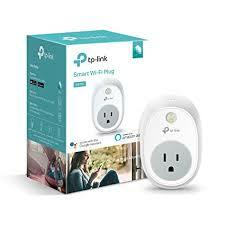 Using your smartphone you can turn off or on any device plugged into this Wi-Fi powered device. You can also schedule your devices to turn off at a specific time. The iRobot Roomba Robotic Vacuum is a cordless and wireless vacuum that can clean your home while you are watching TV or taking a nap. iRobot is controlled by the iRobot HOME app and the vacuum works wirelessly to clean your home. To aide with navigation and to avoid hitting furniture and other objects it is also equipped with a camera. Using the iRobot HOME app you can schedule, start, pause or stop cleaning cycles from anywhere at any time. Would you like to listen to music while you take a shower? If you do then these waterproof speakers are for you. They have great sound, come in many colours and are small enough to fit on the edge of your bathtub.